bCasino is one of the newest online casinos that started its journey in the gambling industry in 2018. Even though the UK based casino does not have much experience added to its portfolio yet, it has already succeeded in gaining a large number of fans. What sets this particular casino aside from many other contemporary casinos lies in its unique qualities which are quite extraordinary in comparison with the rest. We thought that this characteristic was well worth an analysis, so here we are, presenting you our bCasino review. Along with a classic British theme, the casino also portrays a good collection of casino games and a generous amount of bonus and promotional offers for its users. Apart from the regular offerings, it also features a friendly and attentive customer support service. bCasino is owned by GC Technology Limited and licensed by the UKGC. Therefore, you can be assured of the casino’s safety and security. Moreover, the games at bCasino are regularly audited by third-party organisations for maintaining strict fairness. Read our full bCasino review below. bCasino, Only Customers From The UK? If you are from the UK, then good news for you because the casino warmly welcomes players from this region. However, gamblers from Canada, Finland, Gibraltar, Guernsey, Isle of Man, Jersey, Norway, Serbia, Sint Eustatius, Sweden etc. can also enjoy the plethora of games at bCasino. If you are wondering about the restricted countries, you can check out this information at the casino’s own website. A full list of these unavailable regions will be found from the drop-down menu situated at the right side of the screen. If you find your area in the restricted side, do not feel disheartened as the casino is working to fit more places in their service and you may be able to play at this casino very soon. To enlighten you about this casino, we have prepared an in-depth review where you learn about the casino and see for yourself why it is one of the best online casinos out there. bCasino offers almost all the best and renowned software suppliers to make their portfolio strong and enriched. For the fans of Net Entertainment, this casino may be a good choice as the site features a large number of casino games from this leading game developer. Additionally, there are games from Play’n Go, NextGen Gaming, Playson, Aristrocrat, Nektan, Thunderkick, Betdigital, Waxdan, Elk Studios, Lightning Box, Fugaso, Ainsworth Gaming Technology etc. 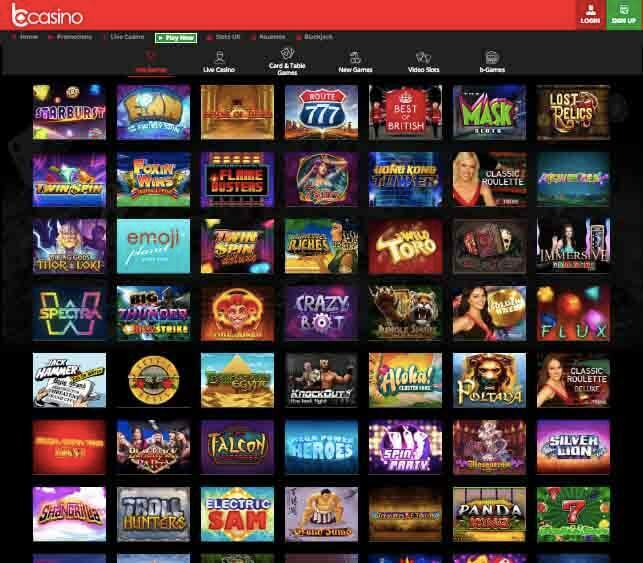 As you can see, bCasino features both old and new game developers, thus you can be sure of finding some of your favorite slots here as well as discovering some brand new gems. The online casino also features a simplistic but elegant outlook which can be enjoyed by their numerous users both from web browsers in desktops and from mobile devices. As the casino maintains an advanced technology in order to provide a smooth gameplay, their excellent graphics can be experienced even from a small display screen. Another positive aspect of the site is its beginner-friendly layout. Similar to many other online casinos, bCasino portrays a black backdrop which is pleasant to see no matter which device you use. All the necessary options and functions are featured in an orange drop-down menu. Even though most of the popular games are displayed on the lobby of the casino, one can also check out other games from the games categories which are displayed on the top part of the site. bCasino offers a good range of casino games from leading game developers. With over 300 games available at the casino, you can expect to see a huge collection of classic slots, video slots, Blackjack, Roulette, Baccarat, Video Poker etc. The fact that both Microgaming and Evolution Gaming is absent from the casino opens up an opportunity for you to avoid the overhyped casino games for a while and enjoy some refreshing and new slots from other game developers. Some of the most popular games at bCasino include Starburst, Best of British, Ivanhoe, Foxin’ Wins, Rich Wilde, Redroo, The Book of Dead etc. You can also enjoy some new slots like, Shangri La, Dracula’s Family, Planet Fortune etc. As there is a wide diversity in terms of themes and genre, you can almost never get bored of bCasinos’s games. Join bCasino anytime and enjoy its attractive welcome bonus which is offered to the new players. The welcome bonus is divided into three deposit bonuses which can be accessed after you create an account at bCasino and gradually make deposits. The bonus package is indeed quite big as you can claim up to £1,200 in bonus money depending on the amount you deposit. There is also an additional 50 free spins up for grabs after you complete your third deposit. However, these free spins can be used only on The Book of Dead slot with the wagering requirements of 25x. In order to withdraw your winnings from the free money, you need to play through all the money you deposited and use the bonus money at least 30 times. bCasino offers a comp points scheme which allows you to gain one point for every £10 wager placed. As you continue to earn these points, you can exchange them in order to receive free spins, free bonuses and many other free prizes. You will also start climbing higher levels as you gather more points. 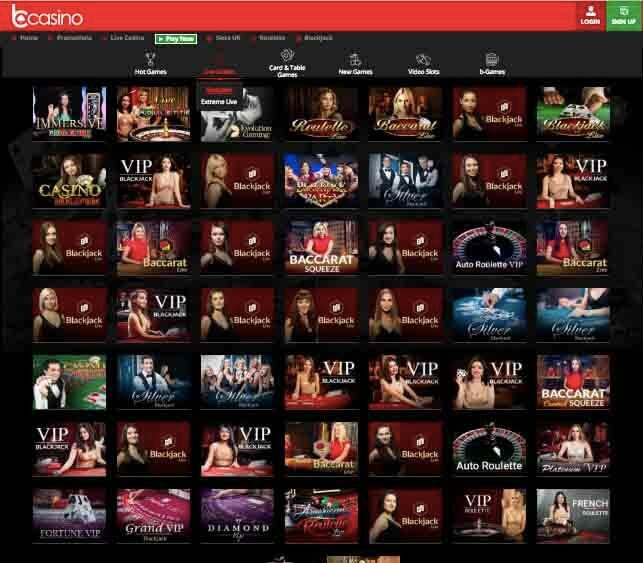 With these points, you can gradually enter into the casino’s VIP club where you will receive exclusive bonuses, promotional offers as well as regular updates regarding the casino’s offerings. Thanks to Android and iOS users, most casinos nowadays put serious thoughts on mobile users while launching a new casino. Such is the case with bCasino whose mobile version is as attractive as the desktop one. It offers a mobile site that is highly compatible with Windows, iOS, and Android devices. We have tested it ourselves and here are the results of our bCasino review: all you need to do is to open the site on any browser on any device and you are pretty much set for a smooth and exciting gambling session. Even though the casino does not have a mobile app yet, it is not unlikely that we will see a bCasino mobile app very soon. Just as the beautiful design from the web browsers amazes us, we are pretty much confident that the casino will excel at the app version too. The live dealer section includes a wide range of varieties with 15 options available for playing live at any given time. Most of these games vary between Blackjacks and Roulettes, but one can also enjoy a few variants of live Baccarat. These games are provided by the renowned software developer, Extreme Live Gaming. As the developer specializes in this very sector, you can expect high definition graphics, realistic features and advanced options in the live games available at bCasino. Apart from regular Roulette, Blackjack, Baccarat, you can also check out Super 6 Baccarat, Sizzling Hot Roulette, VIP Blackjack, Ra Roulette Extreme etc. which are very popular variants at the casino. In order to make the transactions process easier for gamblers from different parts of the world, bCasino supports multiple currencies which can be set after registering at the casino. Since it is a UK based online casino, the most prioritized currency here is British pound. However, one can easily convert this into a different currency and use it during his whole journey at bCasino. So far, bCasino has been accepting 10 different payment methods which are most popular and most convenient for its users. The options include debit, credit cards, bank transfers etc. One can choose a deposit method from the casino’s wide range of options, such as, Instant Banking, Pay by Phone, Visa, Mastercard, EcoPays, Paysafecard, and some e-wallets, Neteller, Skrill etc. For withdrawal methods, most of these deposit methods can be used. Additionally, one can go for Wire Transfer which takes a relatively long time but offers the most secured transactions. Even though the deposit process is completed almost instantly, it can take up to seven working days for the withdrawal processing. The quickest payment system is the e-wallet which usually takes a single day. Whereas it is 3 to 5 days for the debit and credit cards, the duration may last up to 7 days in case of Wire Transfers depending on where you reside. The withdrawal limit is 5000 GBP per month. The minimum deposit required is £20 which is especially convenient for the casual gamblers. Whenever you decide to start playing in a new casino, you usually find yourself checking out the casino’s FAQ section to see how gambling works in that particular site. At bCasino, you will notice a well-packed FAQ section which contains all the necessary information regarding gambling and answers to some of the most common queries. However, if you stumble upon something or simply feel like learning more, you can take advantage of the casino’s highly efficient customer support service. bCasino offers both live chat feature and email service for its users, thus you can always expect aid in times of needs. The company is committed to maintaining 3b’s at any cost: bProfessional, bInnovative and bPassionate. Since its journey in 2018, the site has been taking essential steps to work towards their goal and so far has been successful in maintaining an excellent service. Being a very recent online casino, bCasino has earned one license so far, but that too from one of the most prestigious gambling commissions. The casino gained their permission for legal gambling in 2018 from UK Gambling Commission. Apart from this, the site maintains an advanced technology for ensuring safety and fairness, along with holding regular RTP audits regulated by eCOGRA. bCasino maintains a strict policy when it comes to their offerings. They work relentlessly in order to prove that every single game and slot from their portfolio is fair. To make sure that these are honest and impartial, the casino uses an advanced SSL encryption. Additionally, the games are tested by a random number generator (RNG) random number generator. Individual audits by third -party authorities also take place regularly and keep a safe and fair gambling environment at bCasino. Although bCasino is a safe haven for gamblers from all over the world, the case is not similar when it comes to underage gambling. Anyone below 18 is strictly prohibited from taking part in the casino’s activities. Therefore, new players have to go through a validation process during registration so that the casino can ensure their eligibility. Responsible gambling is another factor where bCasino puts a deep concentration. You can even see “bResponsible: Sleep Well At Night” written at the end part of the website. Therefore, the casino offers you reality check functions which will track your spent hours at the casino and a gambling limit which will help you to manage how much you put at stake. Furthermore, the casino offers you to take a break or self-exclude, even close the account in case you feel like gambling is becoming more of an addiction than a hobby. Even though bCasino is a relatively new online casino, its achievement of a large number of customer base speaks highly of its good quality. Overall, the casino abides by almost every specification that a good online casino should feature, and enters our list of recommended casinos that is totally worth checking out. Our conclusion after the bCasino review, is that it has great potential for new customers. It offers a great Welcome Bonus Offer which, in comparison to more experienced casinos, is a great plus when deciding where to start your online gaming journey. We are missing an UK Free Hotline, though. But all in all, we would recommend bCasino!